Cayle Bywater is still missing. Her last contact with family or friends was on Saturday, December 29, and she was last seen that same day. The Athens-Clarke County Police Department is still wanting to speak with anyone who may have seen her in Memorial Park where her dog was found. The Athens-Banner Herald has reported on the search for her, and a blog has been started to document the search and seek help. Police have disseminated the following photographs. The first is an undated photo of Bywater. 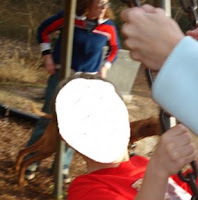 The second shows how she was dressed in the Memorial Park on Dec. 29 as she happened to appear in the background of a photo taken by a visitor at the park. Cayle Bywater was last seen on 12/29/2007 at approximately 1800 hours in Memorial Park, 293 Gran Ellen Drive. Her residence is within walking distance on South Milledge Avenue. Her vehicle, phone, and other belongings were left at the residence. Her dog was subsequently seen running unattended in the park on 12/30/2007. No family members or friends have had contact with Cayle since 12/29/2007. She did not show up for work on 12/29/2007. Cayle is entered on GCIC as a missing person. If you have contact with Cayle Bywater, please notify the Athens-Clarke County Police Department at (706) 613-3330, Central Communications at (706) 613-3345, or Det. Dustin Smith at (706) 613-3888, ext. 795.